Ann Deighton Murgatroyd (1867-1943) was born in 1867 [1867Q2 Bradford, Vol: 9b, Page: 203]. 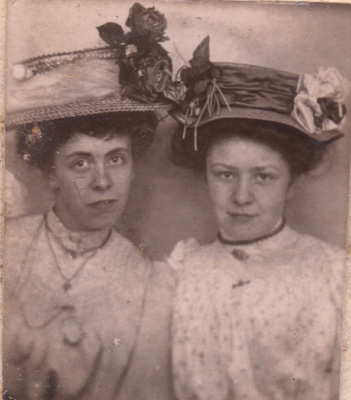 As a spinster (given age of 25) and Dressmaker she married Henry J Hood (1877-1950), a bachelor aged 19 and Grocer Master of Street Houses Carleton, Skipton at the Register Office by Licence on 10th October 1896 [1896Q4 Skipton Vol: 9a, Page: 80]. Her address is also given as Street Houses Carleton. The two fathers are given as James Hood a Police Constable and Henry Albert Murgatroyd an Auctioneer. The witnesses were not of either family. who was a younger son of "Nanny" Murgatroyd. Ann Deighton Hood Wife Mar aged 30 born Shipley Bradford Yorks. 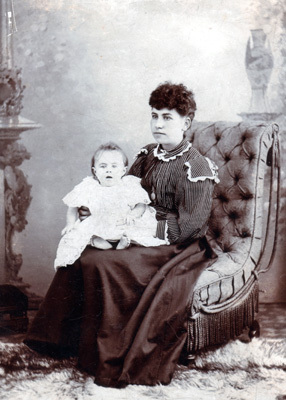 The photo we think shows Annie with a child. She died at 29 Peterborough Terrace, Bradford on 10 Dec 1943 aged 76 [Ann Deighton HOOD formerly MURGATROYD - 1943Q4 Bradford Vol:9b, Page: 193]. She is described as "Wife of Henry James Hood a Master Grocer". The informant was her niece Edith May Woffenden (1903-1985) who was present at the death.